Johnnie Walker Gold Label Reserve Blended Scotch Whisky is a popular Whisky available from DrinkSupermarket.com in 70cl to buy online. 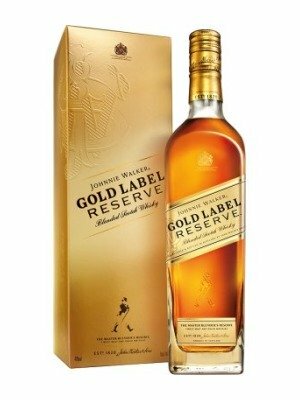 Visit DrinkSupermarket.com for the best price for 70cl of Johnnie Walker Gold Label Reserve Blended Scotch Whisky or compare prices on our other Whisky products. On the nose hints of honey and heather with thick toffee notes and a muted nutmeg spice lead to a smooth and satiny palate with a temperedness that's typical of Johnnie Walker. The finish is long and sweet with a touch of toffee. Where to buy Johnnie Walker Gold Label Reserve Blended Scotch Whisky ? Johnnie Walker Gold Label Reserve Blended Scotch Whisky Supermarkets & Stockists. You can buy Johnnie Walker Gold Label Reserve Blended Scotch Whisky online in most retailers and find it in the Whisky aisle in supermarkets but we found the best deals online for Johnnie Walker Gold Label Reserve Blended Scotch Whisky in DrinkSupermarket.com, 31dover.com, Amazon.co.uk, Waitrose Cellar, TheDrinkShop, and others. Compare the current price of Johnnie Walker Gold Label Reserve Blended Scotch Whisky in 70cl size in the table of offers below. Simply click on the button to order Johnnie Walker Gold Label Reserve Blended Scotch Whisky online now.